In this guide we’re going to show you the quickest and easiest way to watch BT Sport outside the UK. If you’ve been searching for a way to watch your BT Sport account while abroad then your search is over. We’ve created this guide to show you how you can watch your BT Sport account anywhere in the world. All you’ll need is a simple app called a VPN that will let you unblock BT Sport to watch from anywhere. Keep reading below to find out how. To watch BT Sport outside the UK you’ll need to sign up to a service called a VPN. This will let you access your BT Sport account and watch from any country in the world. A VPN is an app for your mobile device or software for your desktop or laptop computer. A decent VPN service will cost around £3 – £6 per month and the longer you sign up for the cheaper it becomes. Just follow the simple instructions below to watch BT Sport outside the UK. 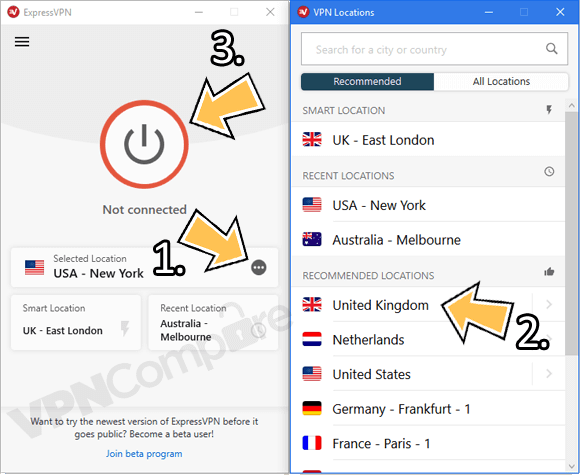 Sign up for the VPN service ExpressVPN (There’s a 30-day money back guarantee so it’s risk free). Download their app from your app store or their software from the Products area of their website. Open the app, press Choose Location, then United Kingdom. Once the app or software has connected all you need to do is visit the BT Sport website or launch the BT Sport app*. *iPad/iPhone Users : It is not possible to use the BT Sport app on an iPad or iPhone using this method. Instead of being blocked like you were before you’ll be able to watch all the live and catch-up sports events. If you think it’ll be difficult or you get stuck take a look at the example image and video below that shows how easy it is to connect on both a mobile device and a laptop or desktop. If you want to look at even more providers then we compare the top 20 in our VPN Comparison Guide. With your new VPN service, you can watch BT Sport outside the UK from any country in the world. This means you can watch every football match that BT Sport show as well as any other sports. You can watch both live coverage and pre-recorded content. One of the bonus features is with the same VPN service you can not only watch BT Sport but you can also watch other subscription or free-to-air services too. That means you can watch BBC iPlayer and other free services and even other services you have subscriptions for such a Sky or Virgin Media. The original purpose of a VPN is to protect your online privacy so you’ll also be protecting your privacy at the same time from government snooping or pesky hackers. BT Sport knows your location. When it sees you’re outside the UK it blocks you from watching even if you have a valid subscription. It does this by checking your IP Address. An IP Address is a little like a phone number, it is unique to you at the time of connection and it also gives away your location. 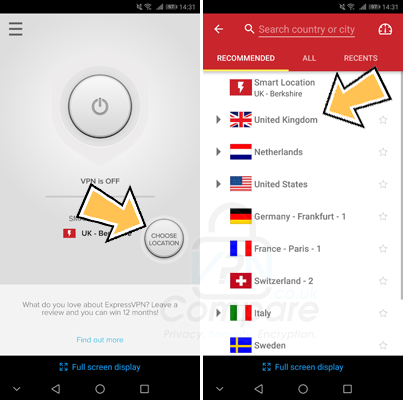 A VPN service alters your IP Address to one from another country. When you connect to the VPN service your IP Address changes to one from the UK so rather than blocking you the BT Sport service thinks you’re in the UK and allows you to watch. Choosing a VPN service can be incredibly difficult. There are now thousands of different providers. 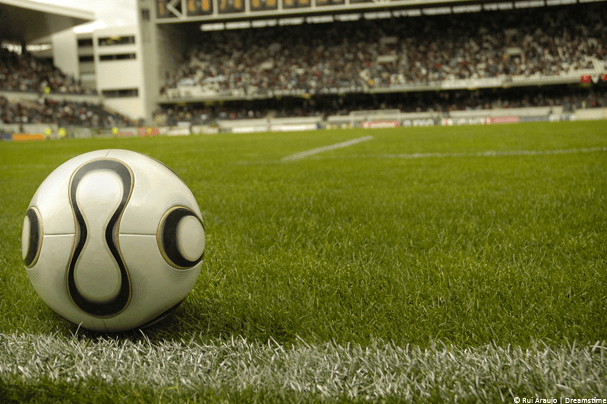 Through our extensive testing we found ExpressVPN to be the best to watch BT Sport overseas. They have some of the fastest speeds and they’re really easy to use. They also have a huge 30-day money back guarantee giving you the peace of mind that if you can’t get it working you can simply get a refund. Plus they have an additional 3-months free when you take their annual service saving you up to 49% off the standard price. When looking for a VPN service to watch BT Sport you need to choose a fast one, if it isn’t fast enough then you’ll end up with buffering while watching which will really ruin your enjoyment. It’s almost impossible to know the speed of a service before you sign-up which is why we’ve done the hard work for you testing a range of suitable services. If you want to know more about ExpressVPN then you can read our 2018 review to find out why we awarded them our Editor’s Choice award. Now you know how to watch BT Sport outside the UK, why not tell your friends and family so they can watch too. Have BT Sport just stopped this, as it now requests me to turn location services on in my ipad, and this then stops the ability to receive the connection to their ipad app, even abroad? Why they would do this is anyone’s guess as I may not continue subscribing now…. Do you mind me asking what country you’re trying to access from and also what VPN provider you use? Are you using an actual app or accessing through their website? I’m in Italy and I use 12vpn.com on my ipad it was working fine and still works fine for Sky and iPlayer is just in the last few days BT Sport have changed something to make sure you turn on the location services if you want to use their app. I can still access the bt sport website via the safari browser and watch the few programmes in their catch up video area but when I try to stream live it recognizes the device and tells me to use their app. I haven’t yet tested it from a normal PC, which should hopefully still work. I don’t understand why they would bother though, surely they want back door entry. Don’t use an iPad personally so can’t comment too much, I guess they will try block it as many ways as possible. Perhaps try cloaking your browser ID which might stop it from recognising you’re on an iPad and let you watch via Safari, something like http://www.dummies.com/how-to/content/how-to-activate-user-agent-switcher-in-safari.html may help. Alternatively have you tried turning on the location services while connected to a UK server with GPS perhaps turned off to see if that works? Same issue. Use VPN now, and it asks for location services to be turned on. Turn LS on, and it bypasses the VPN and reveals where you actually are, ie not in the uk. This is on an ipad. Any ways around this as i cant get it to work anymore? Have you tried turning off GPS if it is on? and trying again? I’m not overly sure how iPad location services work, but I assume via GPS perhaps? Yeah tried turning the location services (GPS) off, but the BT app insists you turn it on. So doesnt work anymore. How about visiting directly in browser rather than app? Yes can login, but says “this video is not available on this device”. For full access please download the BT sport APP from the App store. I tried on a laptop using a vpn and still works, but always found the picture better on the ipad. I think the iPad is forcing people to use the app which then forces the use of GPS. However you might have a point that if there is a way of changing the browser useragent then they could bypass being forced to use the app. I wonder if one exists for the iPad as I don’t have one myself. I’m based in Singapore and m using vyprvpn to access BT sports, but it asks me to log in with details. Do i need to subscriber of BT sports service?? Yes, BT Sport is a subscription only service. What computer/device are you using it on? If a Windows based computer, have you tried InPrivate mode on Internet Explorer or Incognito on Google Chrome? I am using a MacBook to access BTsports. I am so frustrated that I can’t watch the champions league games when a travel via my VPN so any suggestions to solve the issue are welcome. Any joy exiting that then? Yea I read a comment online that stated I need to exit the enhanced player but I couldn’t find a way to actually exit the enhanced player and use the standard player or whatever it called. There doesn’t seem to be any information how to do that and I don’t have BT Sport to hand to look. It seems like that will be the issue (according to BT Sport themselves) but to rule it out, can you contact us via the “Contact” form at the top of the site and I’ll sort you out a trial VPN account with another provider just to make sure it isn’t an issue with your current one. That would be great. If trying another VPN service can potentially solve the issue then it’s worth a try. It will be a few weeks until I’m out of the UK again so I will use your contact form then to request to setup a trial account. As another thought, does it work when you connect to the VPN service and use it in the UK? It shouldn’t do and if it doesn’t it will mean you can test the trail service before you leave to know if it’ll work abroad. Just trying to whittle down the options of what’s wrong. Hi There, you mentioned 2 weeks ago that you can set me up with a trial on a VPN service to check if the issue of with my current VPN provider. Can you please confirm how I can setup the trial VPN? Hi Neill. I’ve dropped you an email, please check your spam/junk folder too. I was using vyprvpn in Switzerland to watch BT sports on MacBook – it worked fine up until about August but since then BT sport no longer accepts the connection through vyprvpn. Not sure what to do. Would changing Vpn provider make a difference? Have they just blocked that Vpn address? Hi, Do you get a specific error message blocking you? Have you tried using InCognito or InPrivate mode on your web browser when using the VPN? I haven’t heard any other similar reports. Hi there, great article. I have just signed up to IPVanish. I’m currently in Nerja, Spain. I’d like to be able to watch the L’pool v Arsenal match tonight on BT Sport. I’ve followed the instructions you gave above but it states ‘Sorry, BT Sports is only available in the UK. Code VC003’ when I try and watch. I’m trying Chrome and have also tried incognito mode, with no joy (I also tried it with Edge). I’m connected to Open VPN (UDP) and to the UK, London lon -a05 (190ms). I’m using windows 10 on an Asus UX305F. Any ideas? Sorry you’re experiencing issues. Firstly, I’d suggest trying a few different London servers. If that doesn’t work they also have servers in Manchester, Liverpool and Nottingham so try those too. Make sure you try in Incognito mode each time. Failing that please let us know and I’ll get in touch with IPVanish to see if there is an issue. You have 7 days to get a refund so if we don’t get this resolved before the match I’ll send you the instructions on how to cancel so you’re not out of pocket. Just out of interest, which team are you watching for ;)? Thanks mate. I’ll give those a try. Not sure I want to help now you’ve said that 😉 Should be an easy game against Liverpool Z ! I’ve tried 4 different servers from all over the UK and it’s still not letting me in. I’ll find out and get back to you. Just checking in to see if you opened a support ticket? I’ve dropped IPVanish a message and will keep you posted. If we can’t get this resolved I have another solution and will send you an email before the match. Reading the above, I am not quite clear. Is it saying it doesn’t matter which VPN you use with an iPad, BT Sport will not work on an iPad outside the UK – even with the recommended IP Vanish? That’s correct. Sorry for any confusion. thanks, so if I were to install a VPN on my Macbook Air I could watch BT Sport then? That’s correct, on the Macbook Air it will work fine as long as you can install apps from the Apple store. Have VPN installed and working correctly but still getting Code: VC011 error when trying to watch on my Mac. Been working fine for months. Have a look at the following, see if it helps.